site collections, it is essential that the navigation between them is quick and effortless. In the demonstration below Peter Kalmstrom, Microsoft certified SharePoint specialist and trainer, shows two ways to navigate between site collections. The first method is only suitable when the web application has few site collections, while the second method can be used even if there are thousands of site collections to navigate between. The links method works in the same way for site collections as links to sites within one collection. Click on EDIT LINKS in the Global Navigation. Paste or write in the path to the top-level site in the site collection you want to link to. Do the same with all site collections you want to link to. The obvious disadvantage of this method is that the Global Navigation links have to be added to the top-level site of each site collection, either manually, by code or by building a custom solution for the addition. Subsites can inherit the navigation from the top-level site, but links cannot be inherited between site collections. Therefore the Links method is suitable only if you have a few, maybe 3–4, site collections. When you have more, you should instead use the Search method. The second way of navigating between site collections is to not link at all. 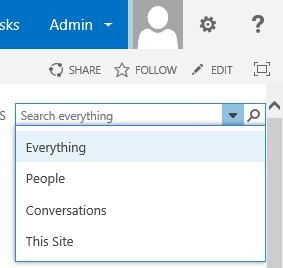 Instead we will use the SharePoint Search feature in an intelligent way. Copy the link to the Search page (without a search term) and add it to the top-level site of the site collection in the same way as in the Link method. This has to be done manually for the top-level site in each site collection. Make a search center for all site collections within a SharePoint farm or web application. That is the way it is done by default in Office 365. Thus all users can reach the center by selecting Search everything in the search box dropdown in the top right corner. To simplify the search you can also create a Search vertical that shows only top-level sites in site collections. On the top-level site of a site collection, go to Site settings and select Add a page. Give the new page a suitable name. Peter calls it "Sites". Edit the web part of the new page. 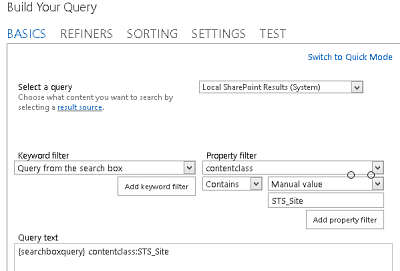 Set the Property filter to "contentclass" and the Manual value "STS_Site"
Add the Property filter to the Query text. To display the new Search vertical go into Site settings and open the Search settings. Under Search navigation, click on Add link. Give the link a title and browse to the page you just created ("Sites"). Now the new Search vertical is displayed with the other verticals on the Search result page, and when you click on it only top-level sites will be shown.